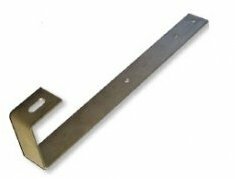 A Click-Fit mounting system roof hook designed for slate roofs. The roof hooks are fixed on the battens. The location of the modules on the roof can be chosen freely because the roof hooks are not fixed on the rafters or trusses. Height variations in the roof can easily be levelled with use of the height adjustment piece or the adjustable roof hook.